In most cases, our patients never notice the advanced technology at work every day making their dental care more comfortable, convenient, and effective, but we are dedicated to offering treatments using state-of-the-art techniques and technologies that are truly transforming the field of dentistry. At Renu Dental, we go above and beyond to make every visit to our office enjoyable. We welcome patients from Crookston, Thief River Falls, and other nearby communities to contact our friendly team to find out more or schedule an appointment. While the majority of advanced dental technologies go unnoticed, one innovation that has greatly impacted patients is the use of intraoral photography. Using a specially crafted, pen-sized camera, we capture images of patients’ teeth and gums from the dentist’s perspective. This makes patient education including explaining areas for concern, potential treatment options, and treatment planning a breeze. Once the images are captured, patients can view them on our chairside computer monitors. There, the dentist can clearly show broken or decayed teeth, and explain what possible treatments are available to repair the damage. Additionally, it’s easy to demonstrate the potential ramifications of foregoing treatment when patients can see how their damaged tooth wears against surrounding teeth and how decay can spread. Intraoral photography can be especially helpful when teaching our youngest patients about how to care for their smiles. We can show them pictures, point to areas that need more attention, and help them find those teeth in their mouth. Intraoral photography has truly transformed the way we are able to interact with our patients. X-rays allow our team to see the inner workings of patients’ smiles in order to effectively diagnose and treat a number of common oral health concerns including tooth decay, developmental irregularities, and more. Traditional x-rays took a significant amount of time to capture, exposed patients to high doses of radiation, required our staff to physically develop them using hazardous chemicals, and the physical images had to be viewed on a special light board. Additionally, these physical x-rays had to be stored and transported which could be a hassle. Digital x-rays offer a number of benefits compared with traditional radiography. The most significant improvement is in the quality of the images produced. Digital radiographs are much higher definition allowing our team to more accurately diagnose oral health issues in their early stages. Additionally, digital x-rays are faster and easier to capture, and they expose patients to less radiation. 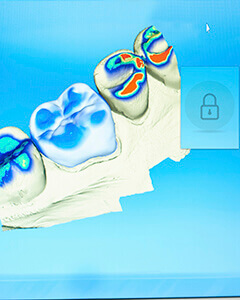 These images are immediately viewable on chairside computer monitors where we can zoom in and out, color code, and otherwise enhance images to help patients understand any oral health issues and treatment options. Digital x-rays are stored in computer files that can quickly and easily be transferred to our patients, insurance providers, or specialists. We are also able to compare images from year to year, to easily determine whether oral health concerns have progressed. Our CEREC digital impression system is another digital technology that has improved our diagnostic and treatment planning services. Traditional bite impressions were captured by having patients literally bite down on putty of varying consistencies to capture the contours of their prepared teeth. Digital impressions are able to quickly, cleanly, and precisely capture even the smallest pits and grooves in teeth for a more accurate treatment plan. Additionally, whether we use our in-office Milling unit to create a restoration from the impression or send it to a trusted dental lab, these impressions are available instantly decreasing the amount of time it takes to craft the restoration. Millions of US adults regularly report experiencing dental phobia or anxiety. However, needles may be even more fear inducing for many people, and when the two are combined – patients are bound to experience some stress. That’s why we’ve incorporated the Wand™ into our practice. This unique local anesthetic administration device looks like a pen, and the tiny injection needle is never seen by the patient. Additionally, rather than numbing an entire section of the mouth, the Wand™ allows us to numb a specific area making treatment more comfortable for patients.